It seems so long ago. Back on January 16 – just a month after the shooting at Sandy Hook Elementary – Senator Patrick Leahy pledged he would hold a series of hearings to address the issue of gun violence in America. As Chairman of the Senate Committee on the Judiciary, Leahy was in a position to set the tone of post-Newtown discussion on gun violence, even as much as President Obama, who rolled out his own priorities for gun violence on the same day. Leahy promised a broad-based approach to the issue, with a series of hearings examining access to guns, mental-health services, and violence in the media. Obama reflected these same concerns in his proposals, and the inclusion of all three issues was crucial to getting support for any comprehensive proposal. Here’s why: we know Republicans and some rural Democrats are largely beholden to the National Rifle Association, which supports candidates through their influential legislative scorecard (which voters use to assess their representatives’ stances on the issue) and their political action committee (which doles out the campaign cash). Because of their influence, most Republicans would never support a gun control law on its own. On the flip side, Democrats have been loath to bring up the connection between violence in the media and real-life gun violence, perhaps in no small part to the fact that Hollywood makes even bigger contributions to Democrats than the NRA does to Republicans. And so a serious effort on both gun laws and the role of violence in the media was paramount to getting anything done in Congress. But despite Sen. Leahy’s pledge on April 16 to include violence in the media as a subject for hearings, none such hearings have taken place. He has held two hearings on gun violence but has not brought forth a single witness from the Hollywood community to testify. Some Republicans have taken it upon themselves to bring the subject up, but Leahy has made it clear that the issue will not be a priority, despite his earlier promise to the contrary. Throwing good faith aside, Leahy moved forward with a bill that would simply ban assault weapons, and just yesterday, it passed his committee along strict party lines, 10-8. The bill will almost certainly draw a filibuster from Republicans in the Senate and rumor has it that several red-state Democrats up for re-election in 2014 are unlikely to support it either. Even if it somehow managed to pass the Senate – which it won’t – it would die a swift death in the Republican-controlled House. Would such a ban have passed as part of a comprehensive gun violence bill that included measure to urge Hollywood to curb their depiction of graphic violence? It’s possible. But since Chairman Leahy and his Democratic colleagues refused to raise the issue that would tick off their campaign contributors – why should they ask Republicans to do the same? It’s a microcosm of the problems that plague our political system. Each side is incentivized to play to their base and barely consider the notion of compromise. Why would they? They need money, and money comes from their special interest base. Democrats get it from Hollywood, the Republicans get it from the NRA, and until that changes, it’s unlikely that either side will be willing to compromise. Although this problem is bigger than one member of Congress, Sen. Leahy bears significant responsibility for failing to make good on his promise – and there is still time for him to do so. If he needs a little help, he should consider that a hearing on Hollywood might even be good public relations. A recent poll – taken a little over a month after Newtown – found that 41 percent adults see the NRA in a positive light, while only 24 percent feel positively about the entertainment industry. With that in mind, why wouldn’t Leahy put some public pressure on Hollywood to reform their ways? It’s pretty simple: he doesn’t want to hurt his friends. Leahy in particular has a uniquely close relationship with Hollywood. In addition to the campaign contributions, he has appeared in the last two Batman films, first as a rich party guest at Bruce Wayne’s apartment and then as a board member of Wayne Enterprises (presumably the same character). It is no more than an ironic quirk that it was at a screening of the second of these films, The Dark Knight Rises, that James Holmes killed 12 people and injured 58 in a gun attack that may have in some way been inspired by the Batman films (Holmes dyed his hair and told police he was “the Joker”). 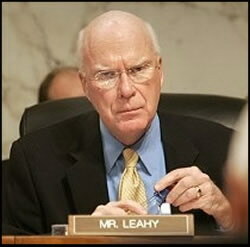 Don’t misunderstand me: the blood of those innocent victims is in no way of Leahy’s hands. But he is in a position to make a strong effort to prevent future tragedies, and it would be a failure of leadership and dereliction of duty if he failed to bring Hollywood into the discussion.